・ Most of the Electrical Contractor will use poor quality cables from China or Indonesia to save material cost. All this kind of cables are not purely made of copper. They are mixed with aluminum, which is not suitable to be used because they are not a good conductor of heat. These poor quality cables can overheated and cause short circuits which may lead to electrical shock or even fire. ・ The thickness of cables of also important. We use 1.5mm PVC cables for lightings and 2.5mm PVC cables for power sockets. Some contractors might use thinner cables as they are much cheaper. 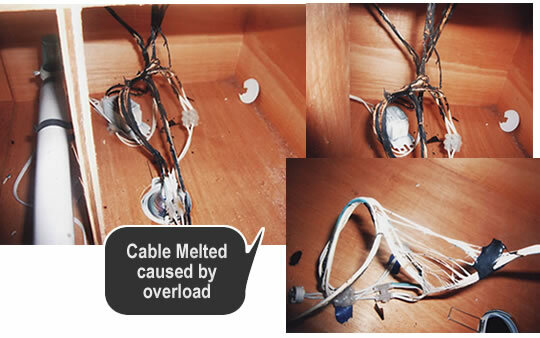 Using improper cable may cause the cable overload and melt(illustrate picture). So you must be aware of the quality of cables that your contractor provides you.